The Basque people live in the area west of the Pyrenees as well as in south-western France. Inasmuch as their language is not related to Indo-European, they are thought of having been the original inhabitants of the area before the Barbarian invasions 100-500 C.E. Basque culture suffered during the Fascist regime but has experienced a revival since Franco's demise. Álava (Araba): This province is very much food-oriented and also has a famous Wine Route, part of the La Rioja wine country. 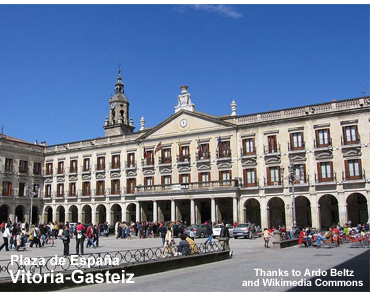 Vitoria-Gasteiz, the capital, was founded in the 12th century and its medieval city center is a popular tourist destination. Laguardia is a picturesque medieval city in the center of the wine country. 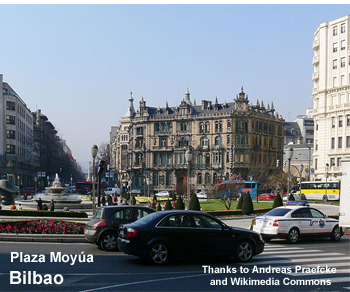 The sizable Enclave of Treviño is completely surrounded by Álava territory and, to this day, part of the Province of Burgos. Inasmuch as Burgos is part of Castile-Leon, the enclave has been the object of bitter conflict between the autonomous governments of the two regions. Guipúzcoa (Gipuzkoa) also known for its gastronomy, including a number of world-class restaurants. San Sebastián, the capital, is one of the top tourist destinations of Spain. The abundance of festivals will make it a European Capital of culture in 2016. Other attractive destinations are: Deba, Getaria, Hondarribia, Irún, Zestoa, Zumaia. Vizcaya (Biscay): Bilbao, the capital, is the metropolis of the Basque country.The Guggenheim Museum has helped make It a top tourist destination. Guernica was the locale of horror in the Spanish Civil War. Durango, Markina, Ondarroa are medieval towns worth a visit. Valle de Villaverde, a tiny enclave in the midst of Vizcaya territory, belongs to Cantrabia. It, too, has been the object of much controversy.